Enjoy a meal with a large group of family or friends when you extend your table with a leaf. Various sizes and quantities allow you to customize the space to fit your exact needs and when the party is over return your dining room to a size that suits your everyday life. Get extra space when you need it by utilizing the simple leaf or leaves included with this table. This beautiful table adds exceptional design to your home dining setting. Featuring four turned legs, the table showcases a large white oak veneer top. Including one 18" leaf for larger occasions and completed with an antique white finish, this table presents a wonderful traditional centerpiece for your vintage dining room space. 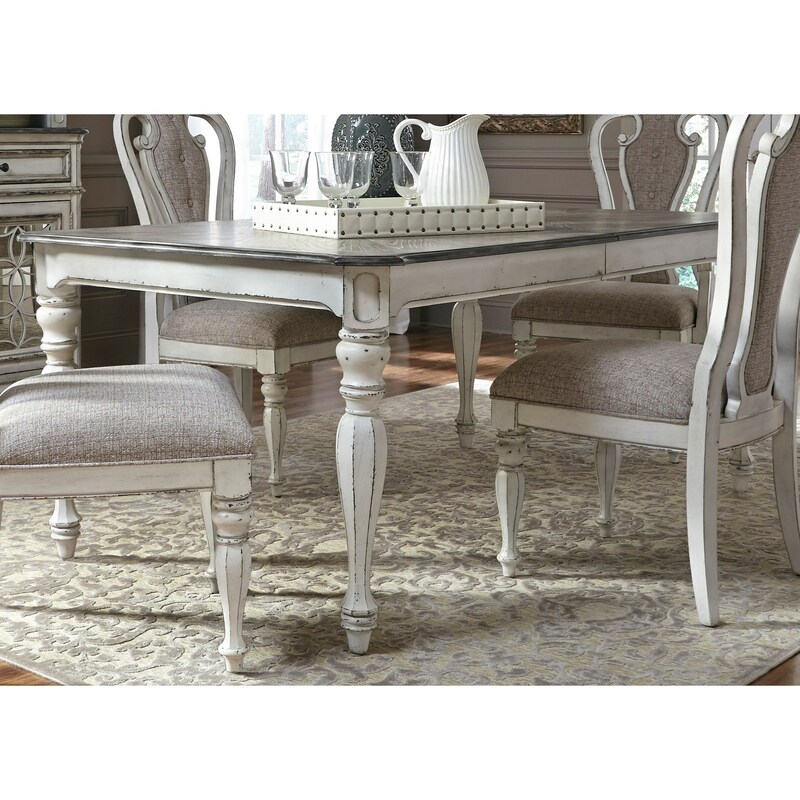 The Magnolia Manor Dining Rectangular Leg Table with Leaf by Liberty Furniture at Royal Furniture in the Memphis, Nashville, Jackson, Birmingham area. Product availability may vary. Contact us for the most current availability on this product. Handles & Hardware Antique brass knob and bail hardware. The Magnolia Manor collection showcases exceptional accommodation and beautiful style for your home. Featuring fully finished French dovetail drawers with metal full extension glides, felt-lined drawers for jewelry and other delicate items, a tufted upholstered headboard, upholstered seating, and traditional style elements, these wonderful furnishings highlight timeless design. Completed with antique brass hardware and an antique white finish, the pieces fuse traditional, rustic, and vintage styles to create a beautiful home space. The Magnolia Manor Dining collection is a great option if you are looking for furniture in the Memphis, Nashville, Jackson, Birmingham area. Browse other items in the Magnolia Manor Dining collection from Royal Furniture in the Memphis, Nashville, Jackson, Birmingham area.